Thanks to everyone whose efforts contributed to a successful soft launch of the Libraries’ redesigned website. The LDPD Web team is continuing to roll out the new (and ever improving) design to all of the many Libraries’ web properties in advance of our official public launch in August. A few examples of our ongoing design integration efforts include custom website searches (e.g. Libraries FAQ), ILL, Digital Collections, and Online Exhibitions. CCNMTL, CDRS, and the Copyright Advisory Office will also be adapting elements of the new design to further expand the consistency of the CUL/IS web presence. In addition to the propagation of our new design, LDPD is currently conducting the first of two usability tests as a way to identify needs for additional improvements in navigation, functionality, and design. This data, in combination with all of the helpful feedback we’ve received, will guide our efforts to provide the best possible experience for our range of users. Our redesign propagation efforts will likely continue into August, and a number of other major development efforts will also be underway. One effort worth noting will be a complete revamping of our CUL Blogs platform, including a system update and new blog theme. Along with a new design, CUL Blogs will be easier to administer on the back-end, and we’ll be able to better respond to requests for new plug-ins and features. As we move into the fall we’ll be making the Libraries’ website even more user friendly, with improved support for mobile devices. And there are many additional enhancements in the queue, so stay tuned. This entry was posted in Blog Posts on July 18, 2013 by Candice. Join us at tomorrow's Assessment Forum from 3:30 – 5:00 in 523 Butler Library. My poster presentation highlights the assessment work we have done to inform the Libraries Website redesign and offers a very brief overview of the assessments we have planned for the next year. This summer we are gearing up to do Usability Studies with undergraduates, graduate students, and faculty; and we'd love to have you help us spread the word and invite participants. This entry was posted in Blog Posts on June 19, 2013 by Candice. The new Libraries Website is LIVE! We had an exciting weekend getting the site up and running. Content Contributors should have access to their pages now for editing. The WCM Login should be live on StaffWeb now. If you did not attend a contributor session, PLEASE NOTE: all the content has moved and the Information Architecture has been re-architected! The new structure is broadly outlined in the "Working with the New Libraries Website Components and Information Architecture" documentation. This covers editing and content changes in light of the new Responsive Design. It's available via the StaffWeb WCM User Guide and in this post. CourseWorks and all other content should now be available for updates and edits. We will be continuing to transition related web services and secondary sites to the new design over the next weeks. We will also be actively working throughout the summer and into the fall to improve the functionality, to respond to usability test results and other assessment findings, and to enhance our users' experience. We've been receiving wonderful and helpful feedback! Thank you! This entry was posted in Blog Posts on June 3, 2013 by Candice. The Libraries' website will be unavailable between 9:00pm and 10:00pm Sunday, June 2. This outage is necessary for the initial rollout of the Libraries' new website. Columbia University Libraries is launching a newly redesigned Libraries Website and a new version of CLIO! We encourage you to join the conversation by taking advantage of feedback opportunities and following us on Twitter @ColumbiaLib throughout the relaunch process. Visit our RElaunch site beginning Monday, June 3, for updates and more information about the redesign and feedback opportunities. Your feedback and engagement is valuable to us, and we look forward to introducing these new tools! This entry was posted in Blog Posts on June 2, 2013 by Candice. The Content Freeze and ReLaunch Have Begun! The ReLaunch process is underway. We have a lot to do over the weekend to transition to the new site! The Libraries Website is now frozen and will be unavailable for editing until Monday. We will let you know when you can begin working on your pages again. This entry was posted in Blog Posts on May 31, 2013 by Candice. You can now add links to and edit your subject guide sidebars (from the top-level subject guide page in your area, e.g. the sidebar for the "Art & Architecture Subject & Research Guides" page will be inherited by all the guides included as child pages below it). I added some standard links (Ask a Librarian, Courseworks, Course Reserves) to them all, so they would have content on Monday. I also added the appropriate locations. We will be updating you about the Courseworks Guides issues later today. The Libraries Website is re-launching on Monday June 3rd. 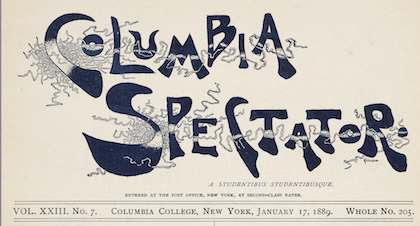 Between Sunday, 2 June, and Monday, 3 June, the Preview Site, http://preview-library.cul.columbia.edu/, will be transferred to http://library.columbia.edu/. Content will be frozen at 5:00 p.m. on Friday, 31 May 2013, for the Libraries Website (http://library.columbia.edu and http://preview-library.cul.columbia.edu), for Hours Manager (http://hours.library.columbia.edu/ and https://hours.cul.columbia.edu/admin/index.php), StaffWeb (https://culis.columbia.edu/), Alumni Friends (https://alumni-friends.library.columbia.edu/), and Behind the Scenes (https://library.columbia.edu/bts.html). Content will be frozen through Monday, 3 June 2013. We will let you know when you can begin editing the sites again. The transition of all all Libraries' web sites into the new design will continue through the days following the launch. These include Serials Solutions services (E-Journals, Summon, and Citation Finder, a.k.a. e-link), our Online Exhibitions (mostly housed in Omeka), the Interlibrary Loan Services, and others. We will be responding to questions as quickly as we are able throughout this transition, and we will be working with feedback and other usability data over the summer to prepare for the increased usage that will come with the fall semester. We will also be offering staff orientation sessions over the summer to address the needs of librarians and others responsible for library instruction sessions and those who work closely with faculty and other researchers, to ensure that you can use the site effectively for your needs. This entry was posted in Blog Posts on May 30, 2013 by Candice. Those with Locations Homepages (generally each top-level page that was formerly under the "indiv" directory) should be able to edit their featured content areas now. If you have problems doing so or have questions, please let us know. Also a number of you, and a number of faculty, have asked where to find the "Custom Search" (or MetaLib) service in the new site. It is now included in the sidebar on all the pages under "Find." This entry was posted in Blog Posts on May 22, 2013 by Candice. Activating pages should now work! Please let us know if you are still unable to activate pages. Contributors to the Libraries' Website should now be able to edit the Featured Content area that is part of the homepage for each library. Contributors should now have access to edit and update the Subject Guides they maintain. This entry was posted in Blog Posts on May 20, 2013 by Candice. Resolver URLs will take you to the current pages (e.g., the Ask a Librarian resolver) until we go live. ALL the resolvers will be updated at one time when we switch the site over. Image captions cannot contain HTML code (including link tags <a href=""></a>). If you create an image link in the component, the caption will become a link as well. URLs (created by what is put in the NAME field in CQ) should be lowercase and, if they need to be more than one word, connected by hyphens (e.g., digital-collections). We are working on the permissions, both for Activating pages and for editing the Featured Content areas. I will send a notice when those permissions issues have been resolved. We will continue to add to our page of Known Issues and update you via the blog as we work through more of our tasks to get the Libraries' site, and many of our related services and sites, ready for the June Launch! This entry was posted in Blog Posts on May 15, 2013 by Candice.